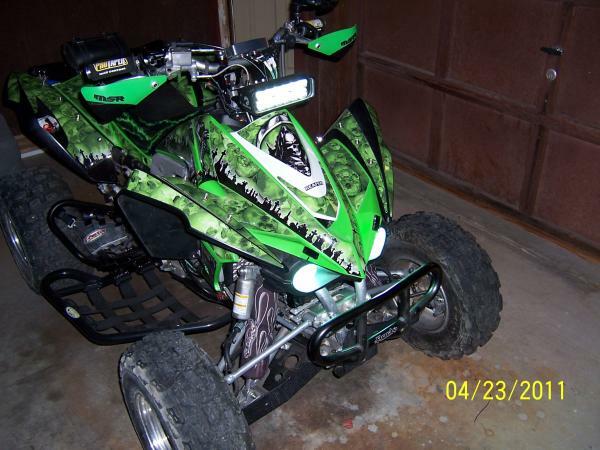 Kawasaki KFX450 Forum :: KFX450HQ.com > KFX450 Performance > Engine/EFI/Drivetrain > Wiseco Cams ? Does anyone have any experience or knowledge regarding wiseco cams for the kfx450r / kx450f? Everything I have read on them seems to be very positive and they are available pretty cheap on ebay. How would they compare to stage 1 or 2 hot cams? I cant seem to find any specs on them. Also is a 3 button fuel controller ok if aftermarket cams are added or would a pc5 be necessary ? A 3 button fuel controller would be fine but the PC5 is awesome! Got mine setup with dual fuel maps and no lift to shift. Works flawlessly! I'd guess that the Weisco Cams are comparable to a stage 2 hot cam. Coupled with an FCI intake, the bike will be a whole new animal. Should see a 5hp increase with a decent tune. Hola soy José y soy nuevo en el foro. He leído que las cam de kawasaki kx450f sirven para el kfx450 y equivalen a un stage 2. Mi pregunta es tiene que ser del 2006 exactamente? No sirven del 2007? Y me servirían estas del siguente enlace? ¿Entonces las de este enlace de ebay me serviría? En el anuncio pone desde 2006 a 2013... Y se podría poner solo la leva de admision? Last edited by Jose Antonio Amaya Garcia; 04-15-2019 at 07:16 PM.